RT is proud to present a unique marathon of live broadcasts. From February 25 to March 1, every single hour and 24 hours a day, we will feature a new live interview from Moscow, St.Petersburg, New York, Grozny and many other places. Russia's most prominent politicians, businessmen and stars of show business will be our guests. In an unprecedented string of live interviews these people will tell you what the new Russia is about, how their lives have been changing and what they expect from the country's most important election. They will tell you about their choice - Russia's choice. 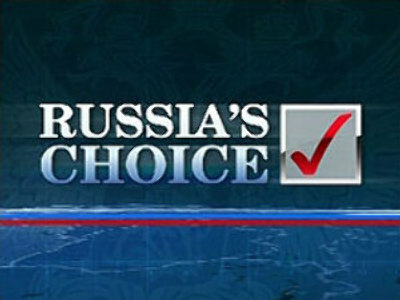 Watch it right now on Russia Today! Kirill Koktysh of the Moscow State University of International Relations joined RT at 11pm to speak on the state of the Russo-Belarus relations. He believes the change in Russia’s policy towards Belarus is possible right after the March 2 election. “After the March 2 election some agreements between Putin and Lukashenko may be reconsidered. And probably this will be a totally new plan,” said Koktysh. Andrey Zolotov from Russia Profile Magazine joined RT at 10pm. He gave his vision on where Russia sees itself in the future. “Russia is certainly a part of Europe. It’s not a part of Europe, which is narrowly understood as the post 1960s liberal democracies, but it is a part of historical Europe,” Zolotov believes. Alberto Adriani, coordinator of a programme for fighting human trafficking in Russia under the International Organisation for Migration, was RT’s guest at 9pm. Even though, he says, Russia has good professional units to fight human trafficking the problem can’t be solved overnight. “Human trafficking is a huge problem for many developed countries. Russia’s not an exception. Russia has good professional units to fight human trafficking, but a comprehensive international plan of actions is also needed to effectively combat human trafficking,” said Adriani. Yaroslav Lissovolik from Deutsche Bank joined Russia Today at 8 pm to discuss the economic aspects of Vladimir Putin’s presidency. The expert stressed that despite high inflation the nominal income of Russian citizens has been growing. “The average economic growth since the 1998 crisis has been around 7 per cent. And even though inflation is pretty high in Russia, the nominal growth of the Russian citizens’ incomes is outstripping inflation significantly,” Lissovolik said. Vladimir Kotlyar, head of the Research Centre for International Security Problems, joined RT at 7pm. He spoke about the security threats Russia. He also touches upon NATO-Russia relations. “The relations between NATO and Russia are rather strained for the time being and it’s, first of all, the result of the practical policy NATO pursues toward Russia,” Kotlyar believes. Ivan Safranchuk, a political analyst from the World Security Institute, was RT’s guest at 6pm. He gave an in-depth analysis of Russia’s policy towards the Central Asian countries. “The relations are different. Some countries are Russian allies given their participation in the Collective Security Treaty Organization and the SCO. Meanwhile relations with Turkmenistan are a bit more frosty. The country is declared a ‘neutral state’. However, Russia wants to remain the major partner to all these countries,” said Safranchuk. Vadim Volkov, director of Development Technology Fund at Saint Petersburg, joined RT at 5pm. Volkov says a new president should first of all tackle corruption in Russia and strive to establish the rule of law. “A set of decisive, legal steps as well as the reform of the state administration and, of course, the political will are needed in order to attain this goal,” Volkov believes. Mikhail Makarov, a restaurateur from Saint Petersburg was RT’s guest at 4pm. Mikhail lived in London for ten years before moving back to Russia. He says small business in Russia has many more opportunities now than entrepreneurs in the UK did when he lived there. “It’s easier to do business here because there are many more opportunities in Russia now. Besides, it’s the right time to do business now because of the stable economy,” Makarov believes. Head of the linguistic project ‘English city,’ Anton Nemchenko, was RT’s guest at 3pm. He spoke about the trouble of learning English, while living in Russia and his unusual method. “The initial idea of my project first came to my mind, because I teach English in the famous St Petersburg Theatre Academy. Such was the creativity of our students that I decided that it would be good to combine these things – learning English and acting,” Nemchenko said. St. Petersburg, Russia’s second largest city, joined RT’s election marathon at 2pm via Igor Ogorodnev. His first guest, Stanislav Tkachenko, Professor of the School of Relations Faculty at St Petersburg State University touched the burning, yet delicate, subject of xenophobia. “The state is paying more and more attention to these problems. We are trying to develop a system of education, to change the regulations of certain institutions. The St. Petersburg authorities consider intolerance one of the biggest problems to be resolved as quickly as possible,” Tkachenko said. Meanwhile, pop diva Valeria, dubbed ‘the Russian Madonna’ shared her ideas on fame, national pride and society's main problems with RT and a crowd of spectators that had immediately gathered upon spotting her at Moscow’s Manezhnaya square. “Human trafficking exists not somewhere far away, but among us. With the power of my music I want to draw attention to this problem and to make people be more careful with their lives,” Valeria said. International relations were under the spotlight again at 1pm, with political scientist Alexander Nagorny appearing at the Manezhnaya square. Nagorny, who is also deputy editor-in-chief of the Russian political-satirical journal ‘Zavtra’, drew a comprehensive map of the triangular relationship between the U.S., China and Russia. “Russia’s position has an advantage. It may lean either to the U.S. or China depending on the situation, extracting vital ‘points’ in the ‘international game’. Such a position creates a huge space for political manoeuvre. However, I don’t see the Shanghai Cooperation Organisation becoming a NATO of its region anytime soon,” Nagorniy said. The capital of the Chechen Republic, Grozny entered RT’s election marathon at 12 noon, courtesy of Katerina Azarova. Her interiewee Said Ahmed Israilov from the American company Medical Corps focused on the changes that have happened in Chechnya in recent years. “We have conducted various meetings, aimed at boosting business in the republic and fighting unemployment. We are looking forward to a big boost in these areas quite soon,” Israilov said. A friendship despite, the 10,000 kilometres that separates them, was also discussed by Vladimir Semago, an expert on economic cooperation between Russia and Venezuela. “There is no desire to be the one most important partner for South American countries, but we need to create a balance. We have freat support in various parts of the world and we want to show European and other countries that we are good partners,” said Semago. Vladimir Kozin’s turn to join the election marathon came at 11am. Kozin, who headed the OSCE Regional Centre in the Kosovan Capital Pristina in 2001, discussed developments in Kosovo. “Many refer to the famous resolution 1244 as the only UN Security Council resolution on Kosovo, while there have been three resolutions prior to it, and one after. So all and all there have been no less then five separate resolutions on Kosovo settlement that have been violated by some western countries,” Kozin pointed out. At 10am political analyst and editor-in-chief of the 'Slovo' newspaper Viktor Linnik joined RT’s election marathon at Manezhnaya square. He gave an insight into Russia's standing in the international arena as the era of Putin. “Russia has stood up in the world over the past eight years. It is again dealt as one of the greater powers in the world. I think this is a great achievement of President Putin. And I’m not talking only about international relations, but also about domestic developments,” Linnik said. Head of the Russian branch of the International Federation of the Phonographic industry Igor Pozhitkov appeared at Manezhnaya square at 9am to address to the ever important issue of piracy. “There were many legislative changes in recent years. Thanks to which, we are pretty well equipped to tackle piracy, including music piracy. But what we still have as a problem in our country is the implementation of laws,” Pozhitkov observed. At 8:00am RT’s Sophie Shevardnadze was joined in the centre of the capital at Manezhnaya square near the Kremlin by Yury Karash, a specialist in space politics. Karash, a member of the Academy of Cosmonautics, and foreign policy expert for John Hopkins University in the U.S., considered Russia’s future in space. “Voyages both to the Moon and Mars are on the agenda of the Russian space industry. Fantastic as it may seem, Russia is more prepared for a Red Planet mission than a voyage to Earth’s natural satellite. Hence back in 1970s, when it became clear that the Moon race with the U.S. was lost, the Soviet space industry concentrated its efforts on reaching Mars,” said Karash.